Luol Deng (born April 16, 1985 in Wau, Sudan, currently in South Sudan) is a NBA basketball player. He plays with the Miami Heat. He was drafted by the Phoenix Suns with the 7th pick of the 1st round in the 2004 NBA Draft. Deng played previously with the Chicago Bulls and the Cleavland Cavaliers. He played college basketball for the Duke Blue Devils. Deng also plays for the Great Britain national basketball team. Deng has Sudanese and British citizenships. 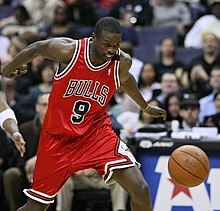 ↑ 1.0 1.1 1.2 "Luol Deng Bio Page". NBA.com. Retrieved 26 January 2013. This page was last changed on 8 October 2014, at 13:57.